Our dedicated team of researchers and engineers are experts in the application of data and process analytics. We work as trusted advisors with leaders across the company to deliver breakthrough ideas and solutions that help Conduent clients capitalize on disruptive changes in technology, business and society. Fifty percent (50%) of current work activities can be automated. Automation improves processing — but it also improves end-user experiences, allowing people to initiate transactions on their own and get answers in real time. Automation reduces the manual parts of a person's job, allowing them to focus on more meaningful and valuable work. Conduent’s automation platform turns the rules of your business into a virtual workforce that can take over repeatable tasks and processes, freeing up your team to focus on more strategic work. Our platforms and resources create the digital, personalized interactions of tomorrow out of the manual business process you’re using today. 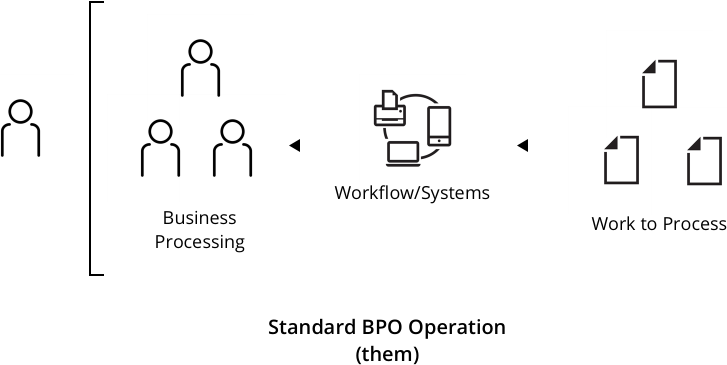 In a standard BPO model, processing heavily relies on manual, repeatable tasks performed by an expensive, error-prone geographically diverse human workforce. Workers interact with disparate systems to perform a single process. In an Automated Digital Operation model, trained software robots perform the same business processes as a human but at higher speeds, higher quality, reduced cost and agile scalability. The software robots interact and connect with the same systems in the same way humans do today, but at faster speeds. They also work 24 hours a day, 7 days a week, 365 days a year and this virtual workforce can scale to meet work demand in minutes. We’re developing a set of platforms to help automate our clients’ business processes. These include intelligent automation platforms that work with conversational virtual agents, as well as rule-based platforms that address automation of repeatable and mundane tasks with robotic process automation (RPA). Our platforms address both back-end unattended automation and front-end intelligent agent augmentation. What do a cruise line, cable operator, state healthcare center and loan manager have in common? They've harnessed the power of Conduent's Automation Platform to drive transformative results. Click the boxes below to read three of our most recent case studies.